What Perils Are Typically Covered By a Homeowners Insurance Policy? Homeowners insurance is designed to help you in the event that something goes wrong – but what exactly does that mean? Fire and smoke. A home, belongings and structures like a garage or shed are all usually protected against a fire (including smoke damage). If the condition of the home requires its residents to live elsewhere for a time, a policy will typically help reimburse for those expenses as well. Lightning strikes. 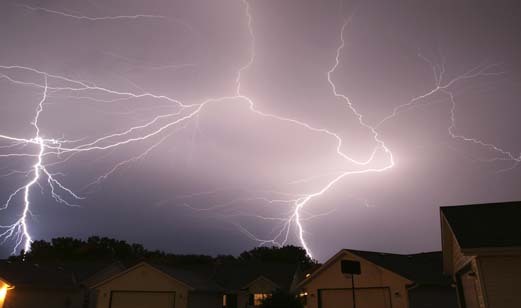 Damage from lightning is typically covered by homeowners insurance. Some policies will also extend that protection to power surges that happen as a result of a strike, covering, for instance, damaged electronics. Windstorms and hail. Wind damage – even when it’s from a tornado – is normally a covered peril. Protection usually also includes hail damage, or wind-driven rain or snow that gets inside after a home has been damaged by a storm. Explosion. Whether it’s from an aerosol can or a propane grill, it’s never good when something goes “boom” in or around a home. Damage resulting from such explosions is usually covered by homeowners insurance. Vandalism and malicious mischief. Homeowners insurance typically covers damage that results from such acts. That would include repairing or rebuilding your home, or replacing your possessions if they were damaged by the event. Damage from an aircraft, car or vehicle. It may not be often that a plane or car crashes into a home, but when it happens, the images can be pretty dramatic. The good news is that most homeowners policies will cover damage resulting from such an event. Theft. If an intruder breaks a window or door to gain access to your home, insurance will likely cover the damage. Items that are actually stolen are generally also protected by the personal property coverage that’s part of most homeowners insurance policies. But you should know that most policies have limits on how much they’ll pay out forspecific types of personal property. Falling objects. Cartoons are known for the “piano drop” gag, where a piano lifted by a pulley suddenly plummets to the earth. It’s unlikely that you’ll experience this same scenario in real life, or one where a meteor or satellite strikes your home – but the good news is that if your home is hit by a falling object, whether it’s a meteor or a tree, a homeowners policy will typically provide protection. Weight of ice, snow or sleet. When the weight of heavy, wet snow or ice causes your roof to cave in, you’ll find that your homeowners insurance will typically cover the loss – for the damage to your home and your property inside. Water damage. Most homeowners policies will cover water damage from burst pipes or water heaters when the cause is sudden and accidental (but not the damage to the pipe or water heater if they burst because of defect or wear and tear). So, if your water heater bursts and soaks your drywall, you’re likely protected from the water damage. Water damage from a flood requires a separate flood policy. Water damage from water backup from sewers or drains or overflow of water from a sump pump typically requires additional optional coverage. A homeowners insurance policy may cover damage resulting from a number of incidents, but likely also comes with a list of scenarios that it won’t cover. Get informed about the specifics of your coverage by reviewing your policy, or simply calling your agent for help. Coverage subject to terms, conditions, and availability. Policy issuance is subject to qualifications. Allstate Insurance Company, Allstate Indemnity Company, Allstate Fire and Casualty Insurance Company, Allstate Property and Casualty Insurance Company, Northbrook, IL. © 2015 Allstate Insurance Company, Northbrook, IL.